Resident home décor expert Elana Kilkenny is an intuitive counselor, sacred space designer, and self-proclaimed "curator of beauty" whose career began on an intuitive whim when she entered a multi-year Feng Shui masters program in the nineties. Elana's style is whimsical, colorful, and eclectic and she has a particular penchant for animal motifs, which she often chooses when designing for clients. Below, she shares 9 pieces that can instantly channel new energy and meaning into your home. "What are spirit animals? Certain spiritual traditions and cultures believe that each of us are connected to different animals that will accompany us through life, acting as guides. Whether it’s through dreams, observation in nature or meditation, there are many ways to find out what your spirit animals are," says Elana. Weaver of fate and awakener of creativity. Prepares you to draw upon ancient wisdom and power. It is also symbolic of royalty and fertility. Symbolizes overcoming that which haunts you and a renewal of vitality and vision. Owl is the bird of magic, omens and prophetic wisdom. 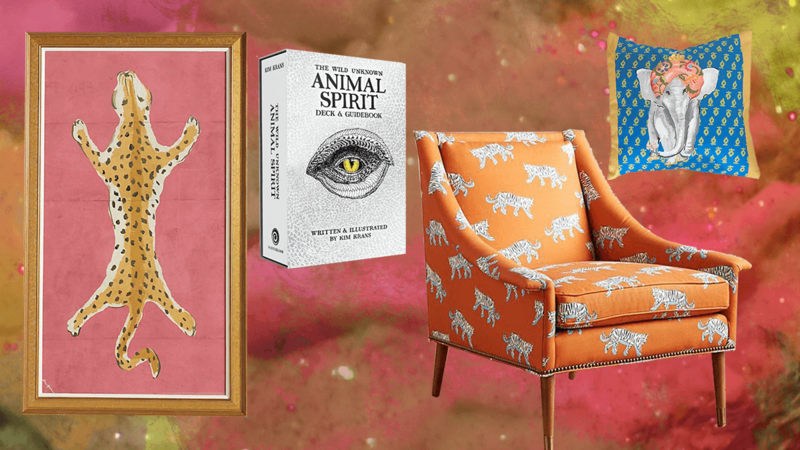 "For your bedside table, go deeper with your connection to your spirit animals through these wisdom-packed and inspiring tarot cards and book set," Elana tell us.